Following hot on the heels of the version 1.0.10 update, we are pleased to announce the immediate availability of the second Dorico update, taking the application to version 1.0.20. This update is of necessity more limited in scope than the first update, since the team had only a few weeks since the last release to work on it, but it contains a number of significant improvements and quite a few bug fixes. Dorico 1.0.20 now supports arpeggio signs, the wiggly vertical lines that denote a rolled or spread chord played on keyboard instruments like piano, fretted instruments like guitar, or percussion instruments like harp. You can quickly create an arpeggio by selecting any note in a chord and clicking the desired arpeggio from the Ornaments panel in Write mode, which adds an arpeggio to the selected chord in the current voice (if there is only a single note in the current voice, no arpeggio sign is created). 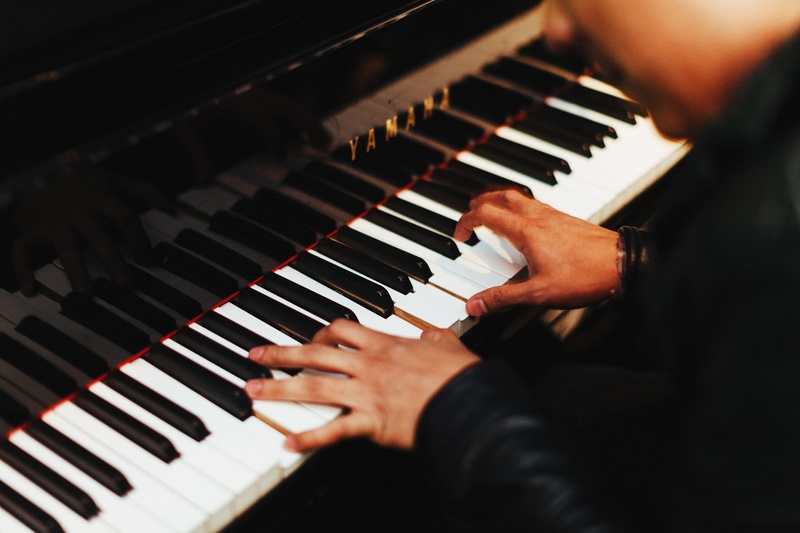 To create an arpeggio that spans two staves, for example to cover both hands of the piano, select a note or chord in one staff, then select a note or chord in another staff at the same rhythmic position, and create the arpeggio. Dorico will automatically create the arpeggio sign with a span from the highest note in the upper staff to the lowest note in the lower staff, and as notes are added or deleted to the chord in either staff, or as the pitches of the outermost notes are changed, the length of the arpeggio is automatically adjusted, finally being deleted altogether once only a single note remains. You can of course also create arpeggio signs using the Shift+O popover for ornaments, into which you can type arp or arpeggio for an upwards arpeggio, arpdown or arpeggio down for a downwards arpeggio, or nonarp or non arpeggio for a bracket that denotes that the chord should not be arpeggiated. You can also enter arpeggio signs in chord mode during note input, simply by typing Shift+O and typing the required term at any point before you enter the final note of the chord. Options for the default length of arpeggio signs, and the default appearance of upwards and downwards arpeggio signs, on the new Arpeggio Signs page of Engraving Options, and you can edit the appearance of individual arpeggio signs using the Properties panel, or adjust their length manually by nudging or dragging them in Engrave mode. Arpeggio signs do not yet have any effect on playback, but this is planned for a future update. Since adding initial support for VST Expression Maps in the first update, version 1.0.20 adds initial support for playback of grace notes (currently not differentiating between slashed and unslashed grace notes, though this is planned), single and multiple note tremolos, and slurs (or the legato playing technique), which make a big difference to the realism of playback of your music. The new Playback Options dialog in Dorico 1.0.20. The new Play ▸ Playback Options dialog contains options to determine how Dorico should interpret specific markings during playback, such as the percentage by which the written duration of notes should be extended under a slur or when encountering a legato playing technique, by how much the dynamic should be increased when playing an accent or marcato articulation, and so on. The dialog also includes an initial set of options for beat stress (the amount by which the dynamic should be increased on primary and secondary beats in the current meter) and for humanization of dynamic level and note start position. A great deal more work remains to be done on improving both the repertoire of playing techniques that Dorico recognises during playback, and on reducing the mechanical sound of those techniques that it already recognises, and this will remain an area of focus for us as we work towards our next updates, along with further improvements to the playback infrastructure, such as support for VST Note Expression, support for multiple input/output ports (as used by e.g. Vienna Ensemble Pro), and so on. Perhaps the area of the program about which we field the most questions on the Dorico forum concerns the handling of rests when multiple voices are active on a staff. 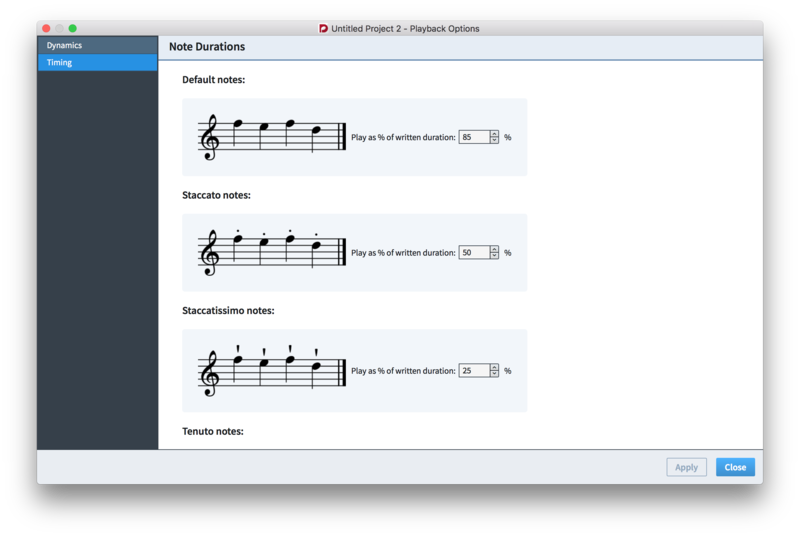 Dorico 1.0.20 introduces a useful new option, found at the top of the Rests page in Write ▸ Notation Options. When working with multiple voices, it’s common for a secondary voice to appear for a section of the music, and then disappear again for a while. By default, when a secondary voice has no more music, it is padded with rests up to the end of the bar in which the last note in that voice occurs, but no further rests appear in subsequent bars. If that voice is then used again later on, versions of Dorico prior to 1.0.20 would pad all of the bars between the last note in the voice and the reappearance of the voice with bar rests, which may well have not been what you wanted. This would force you to go all the way back to the last appearance of the voice, even if it was hundreds of bars ago, and set the Ends voice property on the last note there. To avoid this, you can now set the new Bar rests in additional voices option to Omit bar rests, which means that when a secondary voice reappears later on, the intervening bars will not be padded with bar rests. This option also prevents redundant bar rests from appearing when crossing music from one staff to an otherwise empty staff, e.g. for piano music. The new option is set to Omit bar rests by default in new projects, but if you want this setting in your existing projects, you will have to visit the Notation Options dialog to make the change. Another change to the handling of rests in multiple voices concerns the use of the Starts voice and Ends voice properties within tuplets. Prior to version 1.0.20, it was not possible to set either of these properties on notes within tuplets, which meant that it was likewise not possible to suppress rests within tuplets. This restriction has now been relaxed, which makes some complex rhythmic figures in keyboard music with otherwise invisible tuplets in secondary voices possible to achieve for the first time. There is still more for us to do with Dorico’s handling of rests in multiple voices, in particular the addition of an option to automatically set the Starts voice and Ends voice properties within a range of music to remove all rests in secondary voices, so that you have to visit the Properties panel less often to make these kinds of edits. We hope to get to this further workflow improvement in our first update next year. There are a number of other improvements in this release, including new options for controlling which staves are hidden when empty on a given system, a way of specifying staff size using rastral size in the Page Setup page of Layout Options, exposing more of Dorico’s commands to customisation in the Key Commands page of Preferences, a new option to disable the use of contextual stem directions for notes on the middle line of the staff, and more. As always, a complete list of the improvements can be found in the detailed version history. Dorico 1.0.20 also includes more than 50 bug fixes, including many improvements to the handling of accidentals and key signatures, input into transposing instruments, text editing, and many more besides. A complete list of the fixes can be found in the detailed version history. Over the past week the first in a planned series of quick, focused tutorial videos have been published on the Dorico YouTube channel. If you don’t already subscribe to the channel, please do subscribe so that you are notified of new videos as they are uploaded. The first set of videos describes Setup mode in short bite-sized chunks of around two minutes each. Further videos in this initial set concerning Setup mode will be published before the end of 2016, with further sets detailing the other modes coming early in 2017. So don’t miss out: subscribe now. After a very busy year, everybody in the Dorico development team is looking forward to recharging our batteries a little bit over Christmas, and to reacquainting ourselves with our families. When we return to our desks in January, we will start planning the next update in more detail. The plan is to tackle one or two of the larger functional areas that we know our users (and prospective users) are waiting for us to implement before they are willing to give Dorico a try, and it seems very likely that implementing support for chord symbols will be at the top of that list. On behalf of my fellow Steinbergers both in London and in Hamburg who have worked hard to bring you the initial releases of Dorico in 2016, please allow me to wish you a very merry Christmas and a happy start to the New Year. May 2017 be the year Dorico truly comes in to its own! Presently the ‘detailed version history’ links to the 1.0.10 pdf. Great update – Merry Christmas to you and the Dorico team as well! @César: You should contact support for assistance with this problem. Go to MySteinberg to open a support ticket. Why wait until every bug is fixed, and every update is in? I’m planning to make Dorico a late Christmas present to myself! Thank you for tremendously hard work, and Happy Holidays! I use the demo version and I have planed to buy Dorico in the begening of 2017. It is really pleasant to work on Dorico and confortable for eyes while using computer many hours a days. With actual features and chords symbols I will be more than satisfied. You all made a great job, thank you. See you on 2017 for next Dorico updates. Swing and tablatures will be usefull features. I know it is not planned for the moment, but Cubase integration will be a major improvement too (really, very very usefull for many of us). A touch writing feature like staffpad and a way to make some chords sheet will be fantastic too. Thank you again Daniel, to you and all your team. Thank you Daniel and your team, for all your hard work, dedication and support. Wishing you all a wonderful festive season and time with your families. Once you have support for Chord symbols I will be at the “Shut up and take my money!” phase. Well done guys and a merry one to you all. Sorry I haven’t been staying up to date on the features, but I do need to begin the hardware selection process. With that in mind, is there currently, or has there been any consideration of, support for stylus note-entry? In the features pdf, I see there is an “Integrated Lua interpreter for script plug-in development with basic API” (last line – thank you ; ) Would this API allow plugin development of a stylus entry mode? @Don: No, the scripting API won’t allow for the development of a completely new method of entry, I’m afraid. I’m sure standard entry modes will be sufficient – Thanks! Thanks for making chord symbols the next on the list of updates. I will be ready to purchase when that is available. I hope the program is not as complicated as the buying process was. I tried to buy a crossgrade version (I am a Finale user since 2009 including the newest 64bit upgrade). But it wouldn’t work. After getting the authorization twice I was still never allowed to order the program. I gave up and decided to pay the full price since I really want to try this one out. That shouldn’t have been necessary though. All attempts to contact a support for all this wouldn’t work either. Confusing array of registrations and passwords needed and I still couldn’t get a live body to ask why I couldn’t place an order. If learning this program is going to be equally frustrating I don’t think it is going to do me much good.